I wanted to share this as I thought it was an interesting distinction between past and present methods of warfare. When I was a kid, I thought the coolest fighter planes were the P-38 and the F-16. However, my high opinion of these two aircrafts probably had something to do with my grandfather’s influence. My paternal grandfather served in WWII (U.S. Army), was stationed in Europe, and had worked on P-38s during the war. It is no surprise that he told me that the P-38 was probably the “best of the best!” After the war, my grandfather attended Texas A&M where he earned his engineering degree and later helped develop the F-16. Again, it’s no coincidence that I grew up thinking the F-16 was on par with the P-38. I remember one weekend my grandparents had made the three-hour drive to visit us at our house. My grandfather and I spent the afternoon sitting at the kitchen table putting together a model P-38 airplane. When we finished the model, he hung it from the ceiling in my bedroom where it stayed for most of my childhood. 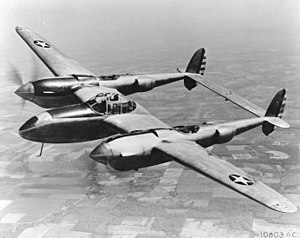 Unfortunately the P-38 was nearly destroyed when it took heavy anti-aircraft fire from my older sister’s jump-rope. I salvaged the pieces and put them into a shoe box, where it stayed until recently. I now have a two-year old son and I have reassembled the P-38 (the best I could) and have hung it from the ceiling in his bedroom. It is pretty cool to see the same P-38 that my grandfather and I made, almost 30 years ago, flying again! Of course, I couldn’t let my son live only in the past. After all, you don’t see too many P-38s today, and there aren’t any left in military service. Today’s focus is on the Predator Drone. I was able to find a small-scale drone and have hung it from his ceiling, only a few feet away from where the P-38 still proudly flies. The only thing I need now are some small Taliban fighters for the drone to target. This entry was posted in Other and tagged 2013, Drone, Grandfather, Model, Personal on April 11, 2013 by Travis Normand.